I'm not saying that Great Bricett is small, but Little Bricett doesn't even exist. However, if you expect some sleepy hamlet lost in the gentle misty valleys between Stowmarket and Hadleigh, you are about fifty years too late. Here we are on the edge of the Wattisham airfield, one of the country's busiest bases. Great Bricett, pronounced bry-set, sits not half a mile from the main gate, a row of old houses concealing more modern ones behind. Whether this concealment is worthwhile, I'm not one to judge; the local planning authorities clearly think so. But turning back to Wattisham, you'll find an ocean of stupefyingly mundane suburbia; flats and houses for the several thousand people who live on the base, all in the kitschy yellow-brick politeness you'd expect on the outskirts of Ipswich or Cambridge, not here in the middle of nowhere. Fortunately, a rise of fields separates us from this madness. 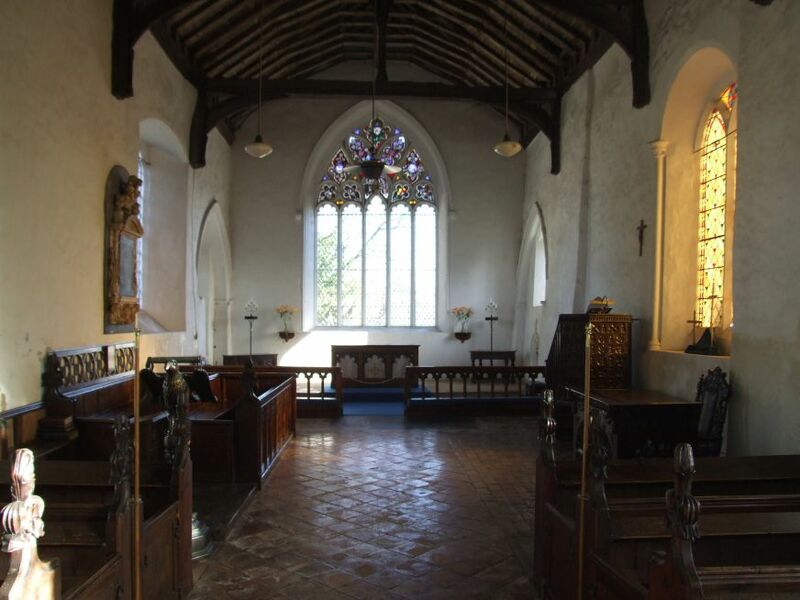 Also concealed is Great Bricett's church, set back from the road up a narrow lane, in a pretty square of fine houses. A first sight of this church inevitably elicits a reaction of what's going on here, then? 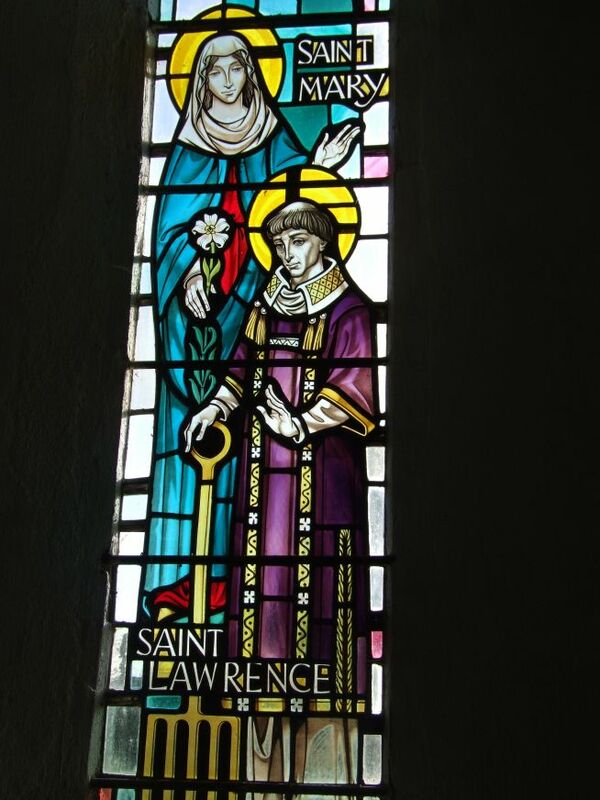 for St Mary and St Lawrence is nothing if not unusual. 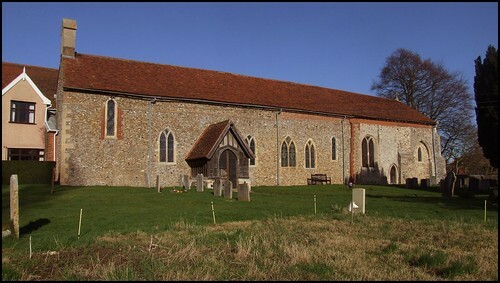 It is extremely long and towerless, and has a nave and chancel all under the one roof. A 16th century house is built into the west end of it. The south side is like an encyclopedia of early medieval windows - few styles are unrepresented - and a curious arch at the east end reveals the site of a former transept chapel. The porch and the little bellcote are both modern. A huge Mass dial is set to the east of the porch - it must be fully 40cm across, and easily the county's biggest. It is above a blocked doorway, and the arch stones beneath it give it a sense of scale.The porch itself also contains scratchings of interest. The Norman doorway has an incised inscription on its columns. At some time it has been rebuilt, and the letters are no longer in the right order. You can just about make out the word Leonardus. Now, why on earth should it say that? You step through into a splendidly atmospheric space; long, low and full of coloured light reflecting in the polished floor. Again, you are struck by the strangeness of it, of something not being quite normal; and you are right, for St Mary and St Lawrence was not built as a parish church at all. What we have here is the conventual church of a Benedictine Priory. It was an alien cell - that is to say, it was a daughter community of a French Priory, St Leonard near Limoges. Such things were not unusual of course - in the Middle Ages, the Church in England was far more international than it is today - but such communities were vulnerable at times of war, and inevitably this Priory was separated from its mother, and given its independence in the 15th century. Eventually, it was suppressed, and the church became a Parish church. There is a plan of the Priory on display inside, and it was very big - the current church formed the south side of a large square. 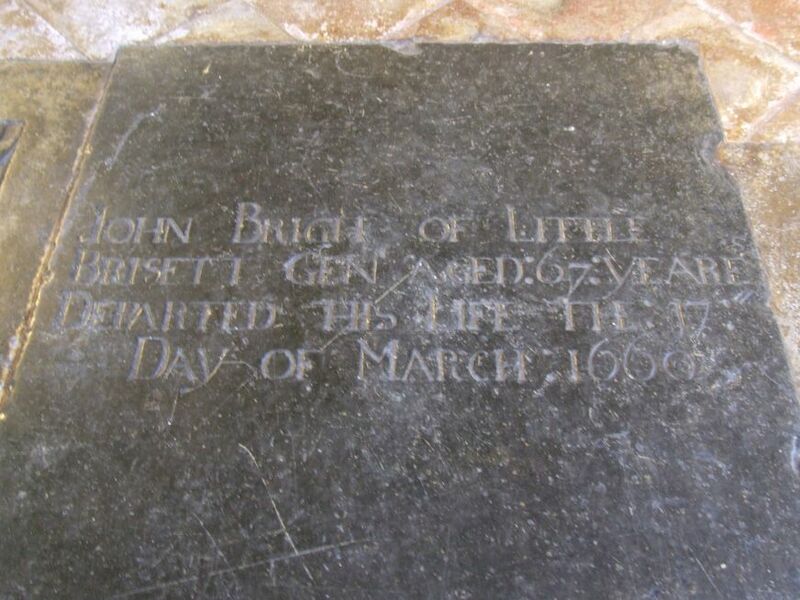 The dedication of the church is a modern one; the St Lawrence bit comes from the long-vanished church of the long-vanished village of Little Bricett, a mile or so away. 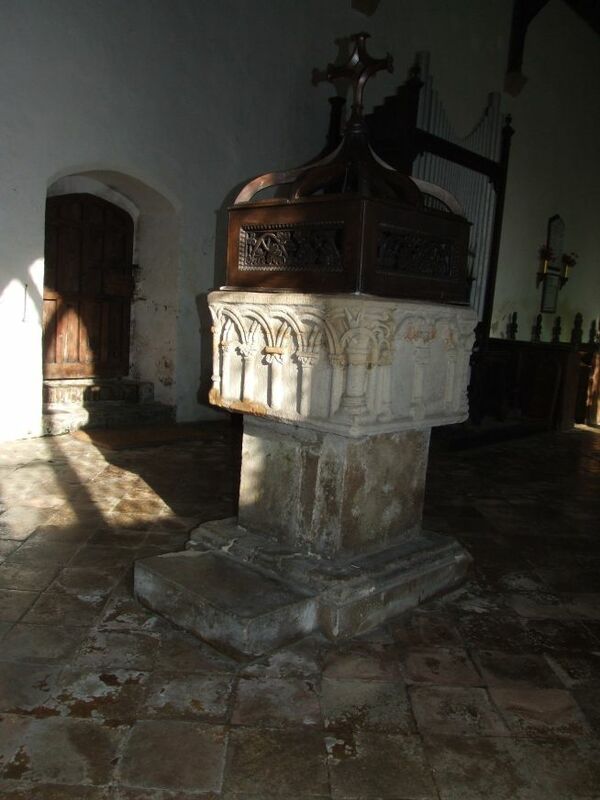 The centrepiece of the western end of the church is one of Suffolk's best Norman fonts. The interlocking arches, jaunty and cartoonish, are so different from the elegant Decorated tracery that future centuries would bring. They are survivals, not just of a craftsman's work, but of his imagination. When we see the artwork of the later medieval period, it is as if we understand what they were getting at. But Norman artwork like this is mysterious, as if produced by a culture with a quite different mindset. Most Priory churches did not survive. Ironically, those that had been attached to alien cells sometimes did, because they had been removed from their foreign influence during the 14th century, and the church would have assumed a community purpose before the dissolution of the monasteries in the 1530s. This may also explain the survival here of some superb medieval glass, in the form of the four evangelists. It has been fairly heavily restored, probably by the King workshop of Norwich, but the shape of their tracery shows clearly that they were once in the great east window. There is also a lovely modern window showing the two current patrons of the church. Mortlock says that it is by the Maile Studio of Canterbury. This nice modern touch chimes well with the patina of age, although like all churches in this area, St Mary and St Lawrence was very comprehensively restored in the 19th century. Diocesan architect Richard Phipson seems to have had a special eye for the Stowmarket/Hadleigh/Bury triangle, and although this chancel is not one of his, it is in his best middle-brow ritualist taste. I got the impression that it had once been more elaborate, for now the sanctuary has been simplified in a most pleasing way, the furnishings set against the plain whitewash of the walls. The flowers either side of the window are a nice touch. Turning around and facing west, it is as much the light as the width that overcomes the heavy memorial to John Bright in the north wall with a tasteful sense of the numinous. The miserable little cherubs seem to glow in the sunlight. The arches in the walls mark the locations of former chapels, and the east window upper tracery is filled with coloured glass, a fine balance to the white light beneath, the white walls around. A spendid atmosphere in a church quite unlike any other in Suffolk: what a contrast with the housing estate over the hill.